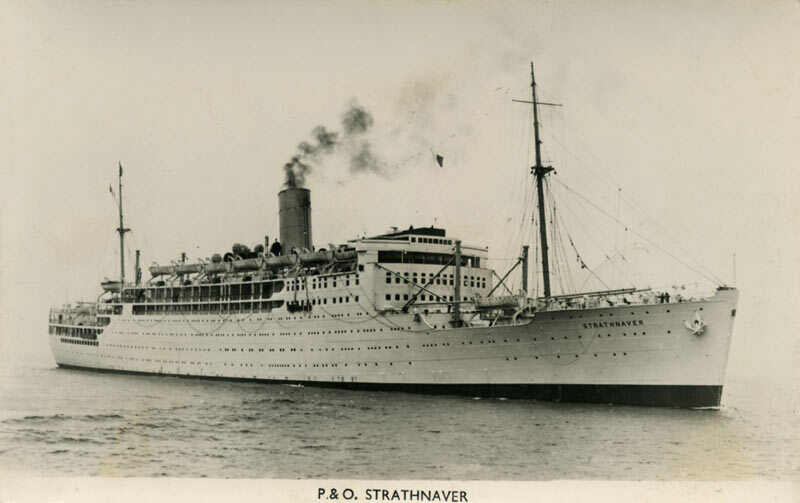 Strathnaver was the first of the Strath Sisters, ordered in January 1930 by P&O's Chairman, Lord Inchcape. She was launched on 5th February 1931 at Vickers Armstrong Ltd, Barrow in Furness by Lady Janet Bailey, Lord Inchcape's second daughter. Lady Bailey was vice-president of the London Ladies' Harbour Lights Guild and patroness of the Ladies' Harbour Lights Guild of Melbourne, and strongly associated with the Mission to Seamen practically all of her life. Beautiful in her dazzling white livery. The first of five Strath Sisters was specifically designed for the UK-Suez-Bombay-Australia run. 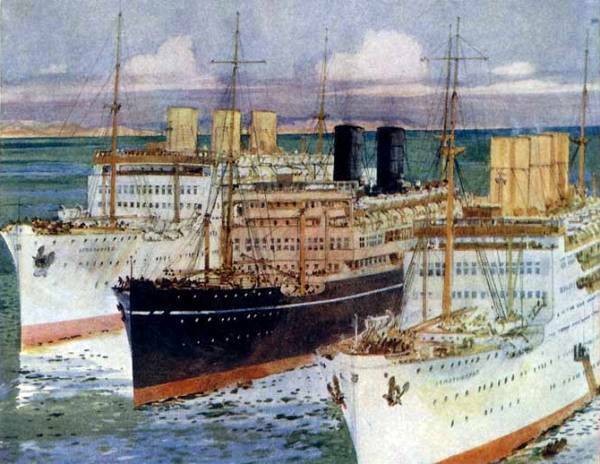 This was only the second time that P&O had given its ships three funnels - the first being Naldera and Narkunda in 1918 and 1920. British public opinion in the early 1930s, tended to judge the power and safety of a ship by the number of its funnels. Her forward and after funnels were dummies, always lacking the soot-smudged top of the funnel in between. 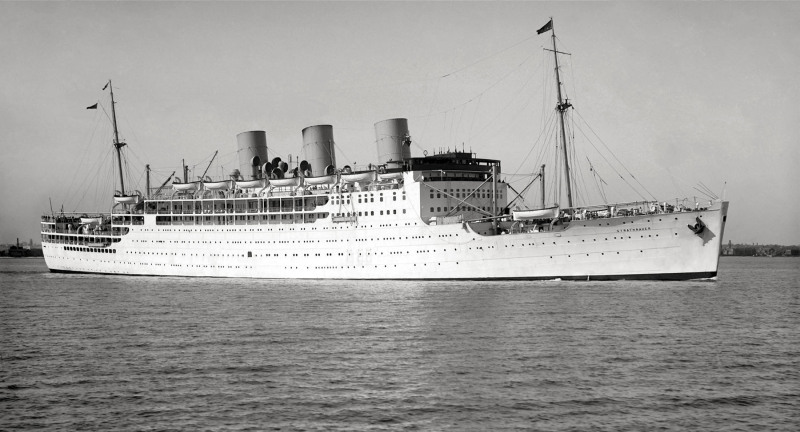 On 26th August 1931, she successfully completed her sea trials and was handed over to P&O on 2nd September. 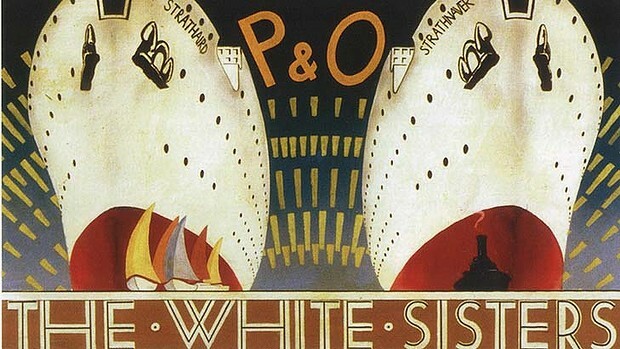 From the start, she introduced the highest standards on the Australian mail service - an imposing ship and the first major P&O passenger ship to adopt the white hull and buff funnels that later become P&O's signature livery. 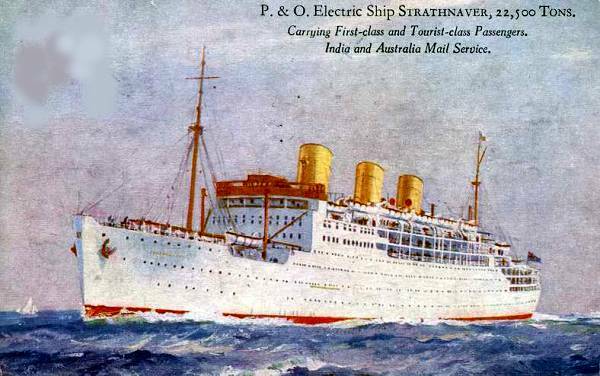 Like her sister-ship, Strathaird, she was powered by turbo-electric machinery, first pioneered in the Viceroy of India in 1929. 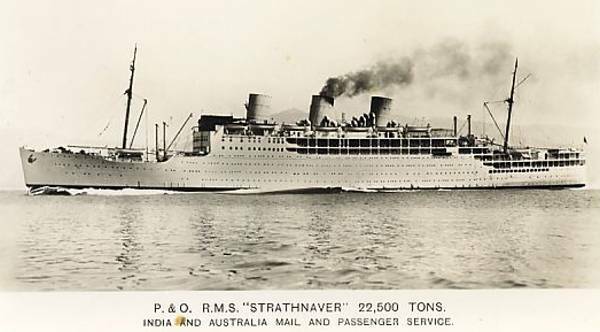 Strathnaver sailed from Tilbury on her maiden voyage on 2nd October 1931, calling at Marseilles, Suez, Bombay and Colombo, en route to Australia. Her arrival at Sydney was greeted with much excitement. The bridge was still under construction and not formally opened until 19th March the following year. 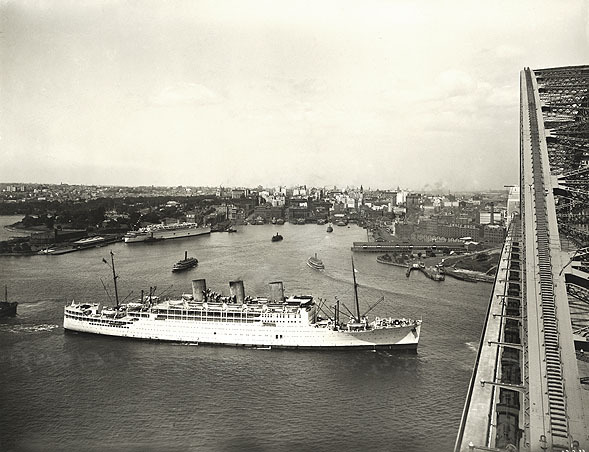 Strathnaver, floodlit at Circular Quay, Sydney - maiden voyage 1931. Strathnaver and Strathaird followed the Viceroy of India on cruises, between their regular sailings to Bombay, and Australian ports. 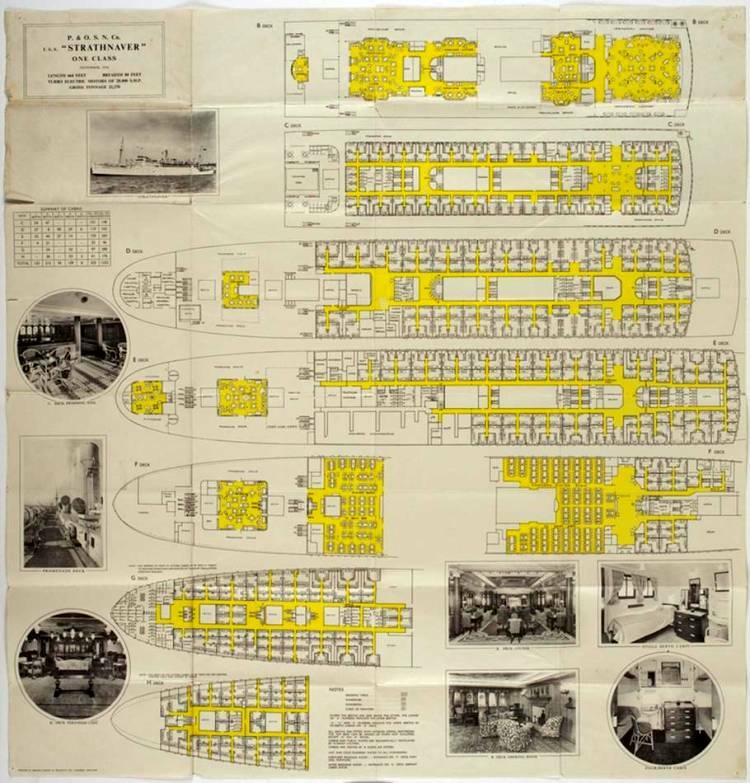 On 13th May 1932 a dinner was given on board, at Tilbury, to mark the end of her maiden voyage, with all the speeches broadcast by the BBC Home Service. Strathnaver at Lisbon in 1934. Passengers formed an Entertainments Committee, usually under the watchful eye of the Staff Commander or Chief Officer, and arranged fancy dress, deck sports and 'spoof' entertainments - such as the Strathnaver Kennel Club event, which took place on Monday 28th May 1934. 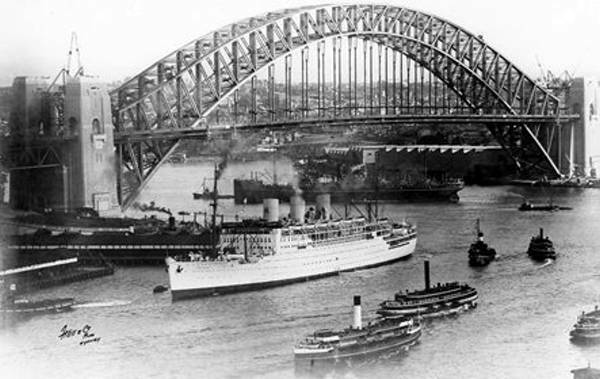 In 1938, additional refrigeration was installed, enabling her to carry chilled beef from Australia to the UK. 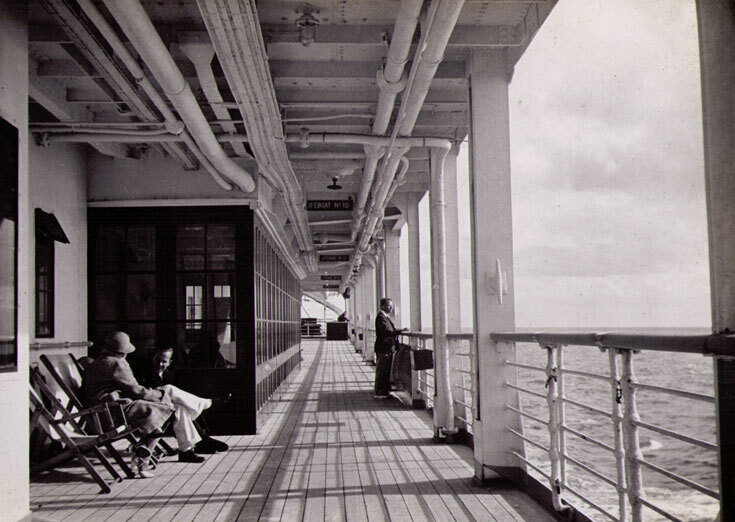 Strathnaver's boat deck, starboard side. 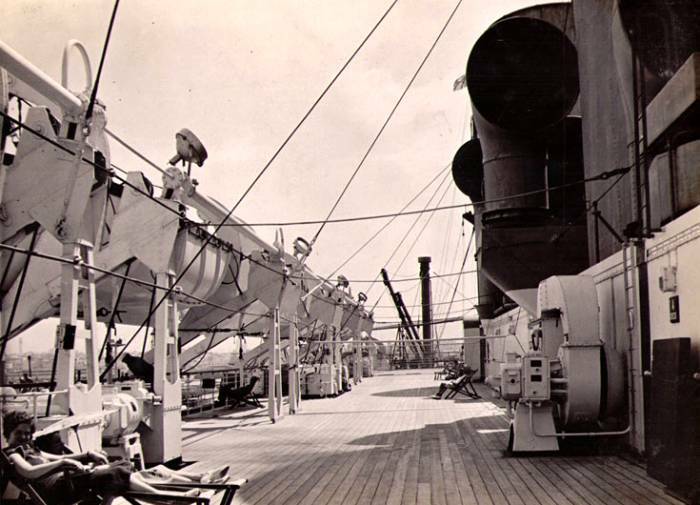 Strathnaver's boat deck, port side. Looking aft from the bridge, port side. 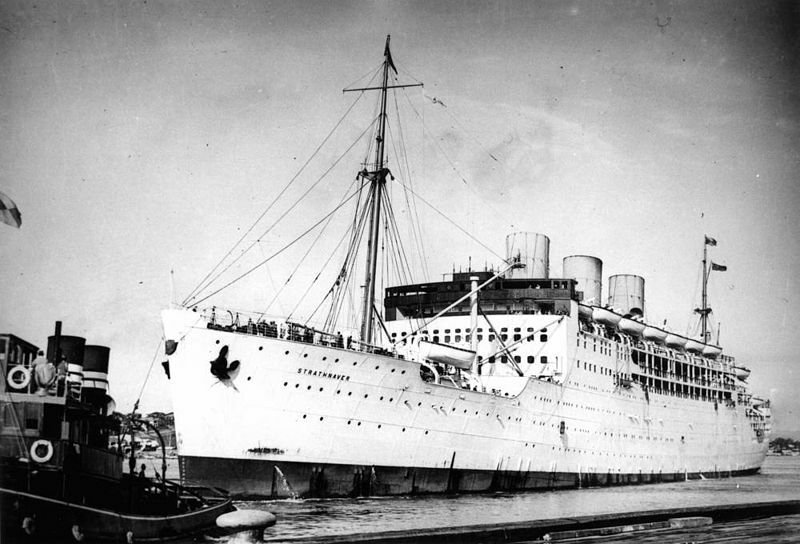 In October 1938, the ship was chartered to transport 1,200 British troops from India to Palestine. 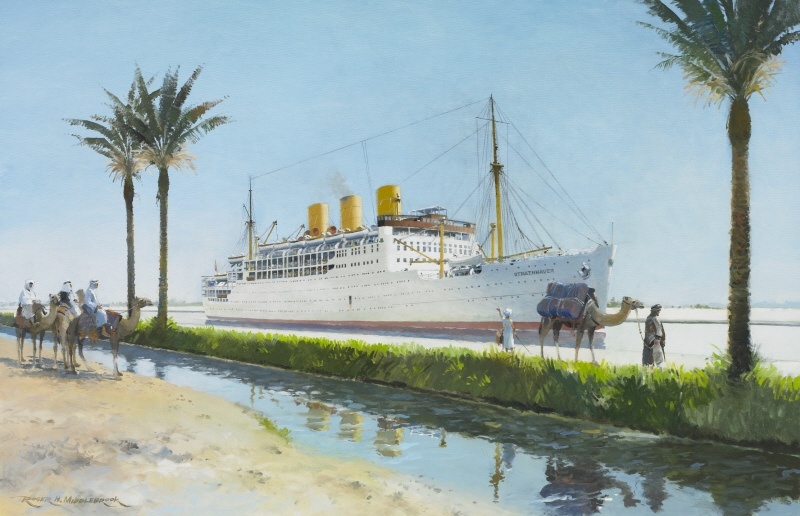 By the end of 1939 troop convoys from Australia and New Zealand had already been planned and the Strathaird, Empress of Canada, Empress of Japan, Orion, Orcades, Dunera, Rangatira and Strathnaver were part of the first convoy carrying Australian and New Zealand troops to Suez, sailing from Fremantle in January 1940. In the middle of April a further convoy brought more reinforcements from Australia and New Zealand to the Middle East. Strathnaver at Gourock, in wartime grey. Photo: The Imperial War Museum, London. 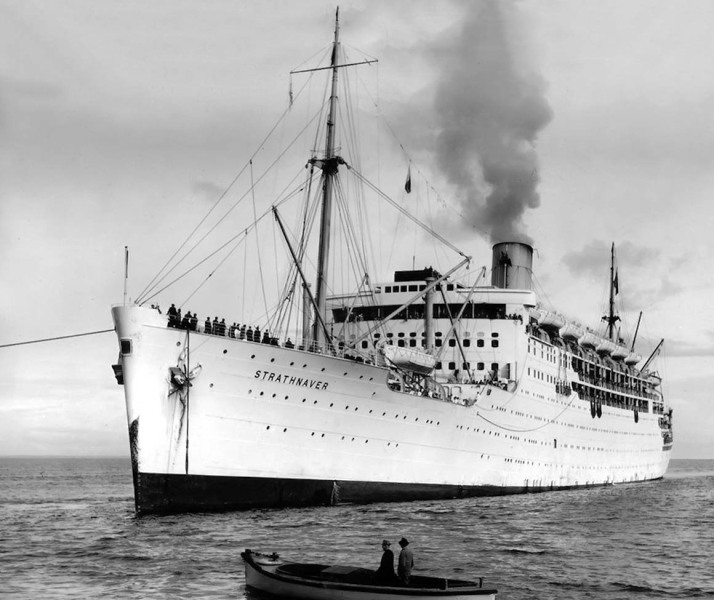 Strathnaver was requisitioned by the Government for service as a troopship on 7th January 1940. Her initial war tasking involved embarking Australian and New Zealand troops and transporting them to the Middle East theatre. 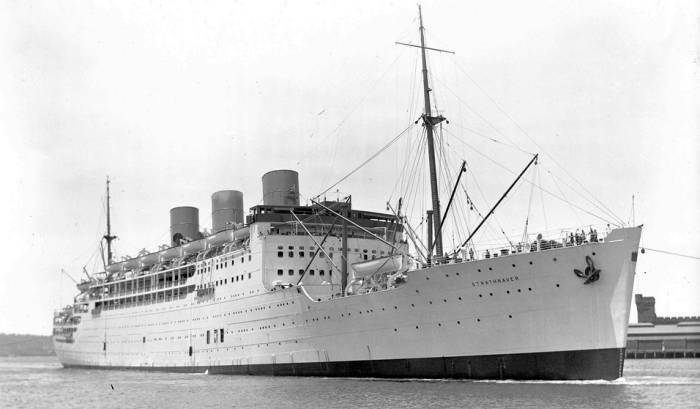 On 11th November 1942 she disembarked troops at Algiers as part of Operation Torch. 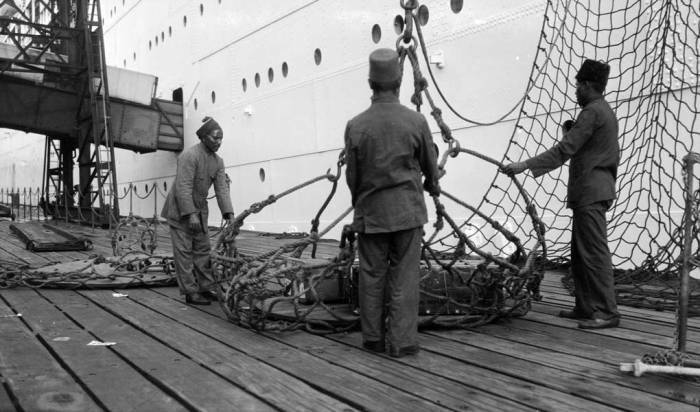 The following day found her ferrying survivors from the P&O Company's Cathay and British India’s Karanja from Bougie to Algiers, while subjected to enemy fire. On 5th June 1943 she was used as a training ship for the Italian landings, scheduled for later that year. In 1944, she took part in the Anzio landings. 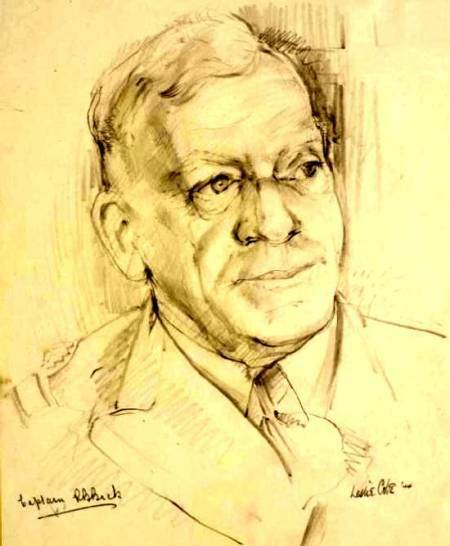 Strathnaver's wartime Commander, Captain Beck. Source: The Imperial War Museum, London. 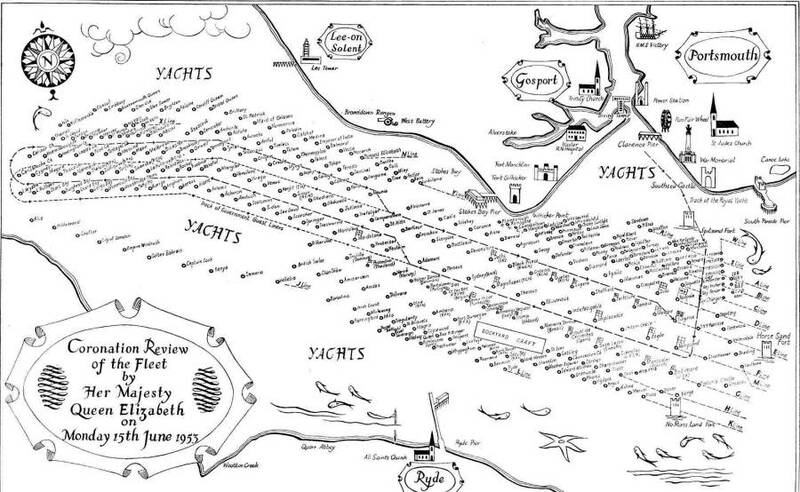 "Down we went to the bottom of the ship into a cubbyhole grandly labelled "G" Deck, 150 men. The 250 of us assigned there dropped our packs, duffle bags, rifles, barracks bags and musette bags. Then acting on the advice that it would be O. K. to sleep until called we put up our hammocks and settled down. Twenty minutes later (about four o'clock) we were told to strike hammocks; a general reshuffling had been decided upon. 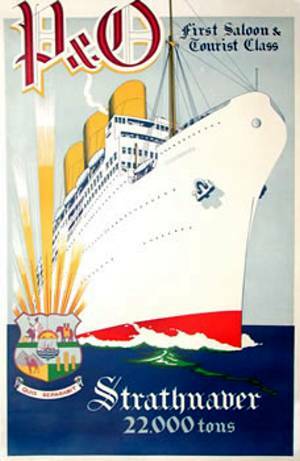 So began our trip on the Strathnaver, former British Luxury Liner (it said on the Bulletin Board) and not once did our experiences fail to live up to this promising beginning. The strip stank! Picture a can of sardines . . . one sardine lies snugly against the next, not a bit of room is wasted in that can. But sardine packers are amateurs compared to the genius who figured the shipping arrangement of "G" Hold of the S.S. Strathnaver. We slung hammocks suspended from the ceiling, and before the end of the trip we were in three layers . . . woe to the man who had to visit the latrine after lights out. That was "G" Deck. 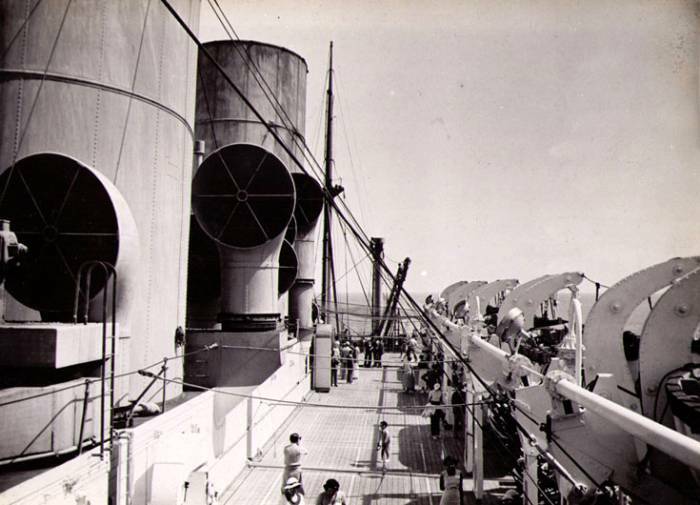 But Able Battery and the Officers slept in luxury on A Deck - plenty of room and superior chow. Of course extra duty went with the quarters (as ye sow so shall ye reap); A Battery manned the AA guns aboard and the officers were busy with whatever officers busy themselves with. The food was good ... if you had been two weeks without a meal. Fortunately for us chow was served only twice a day (we ate in the same place we slept in) so that our sleeping quarters were fairly aired by the time we were ready for bed. It was not surprising, considering the conditions under which we lived, that after the first three days most of us could be put in one of three categories: The "Always-OverThe-Rail" type (or nearly dead), the "In-The-Bunk-All-Day" type (or won't someone kill me, please), and the two men who were in the "Look-At-The-Landlubber" class. 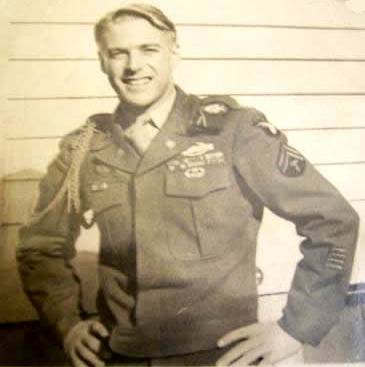 Most of our time was spent in writing letters, walking on the deck, watching the skies for enemy planes, searching the horizon for enemy warships, and watching the escorting destroyers racing over the choppy seas like sheep dogs around a herd. All the aforementioned activities being done only on the calmest days. We survived by sending the fittest man among us to "D" Deck where the Ship's Store (PX) sold an unlimited supply of cokes, cookies and Hershey bars. These were our main sustenance without which we would have all arrived at Liverpool "gaunt, grim and ghostlike". We had calisthenics, too, and guard duty, and police details as well as the ever-present poker, black-jack and crap games (all strictly forbidden). The trip did finally end, although there were some of us who believed it never would, on the 16th of December 1943. Our first sight of land was celebrated by a spontaneous movement to the still bulging food lockers in the lower holds where oranges, cheese and pound boxes of corned beef were stealthily snatched and hysterically devoured by the starving E. M. (The British black market suffered a terrific loss that night!)" Chip Chapin, whose father sailed aboard Strathnaver. "After a year of rigorous training the 502nd shipped out for Europe aboard a British ship. Carleton remembered it all very clear. The SS Strathnaver sailed for 6 days before it had to make port on September 11th 1943 in St Johns, Newfoundland for repairs. 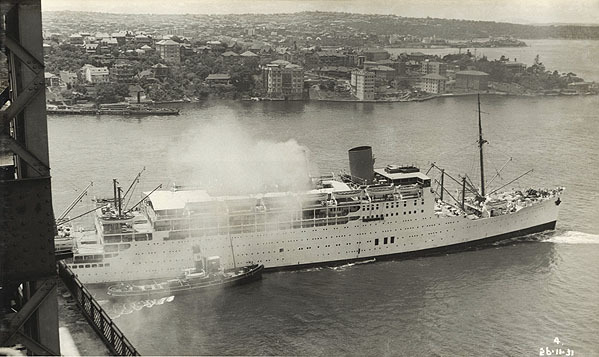 The ships fresh water tanks were discovered to have salt water in them… It took weeks to repair the ship, and by the time the ship headed back out to sea it hit some rocks in the harbour. 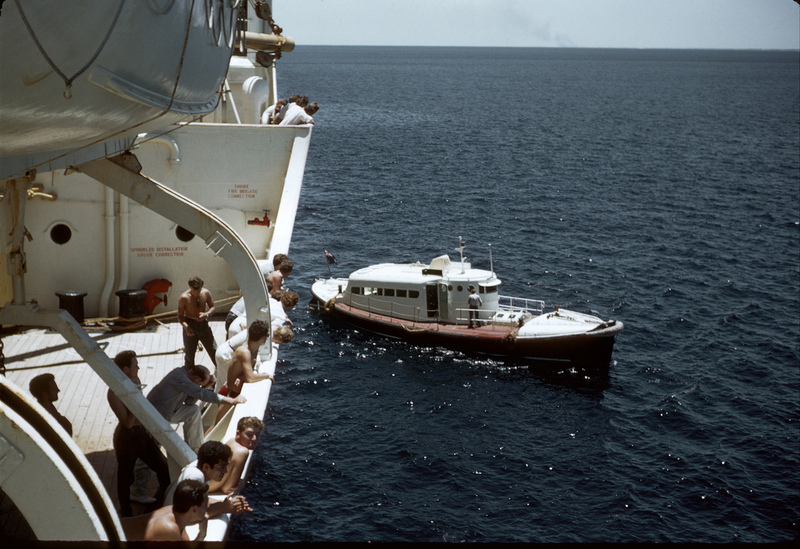 A day later and an extra 28 inches of water aboard the men had to wait again. Wait? No way. Road marches, barracks inspection drills and PT (Physical Training) exercises. On October 4th the SS John Ericson docked at Newfoundland and took the men toEngland, arriving on October 18th. The journey from the US to England took a total of 44 days. Everybody aboard received the American Defense Ribbon because it was such a long time at sea." 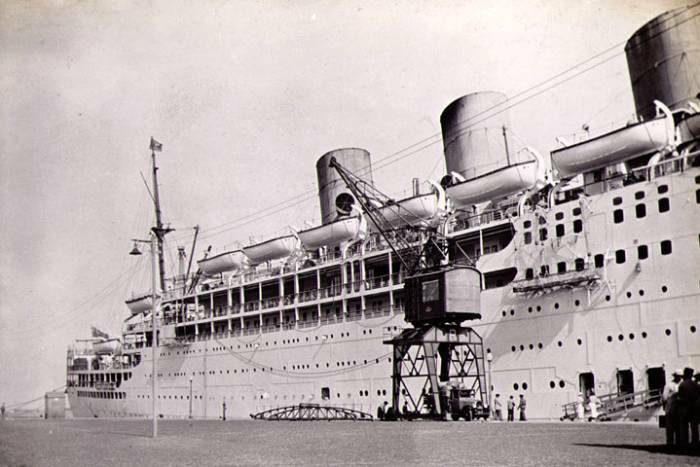 My Mother boarded the Strathnaver at Southampton on the 11th July 1940 and sailed on the 13th for Australia. I have her diary of the full voyage. It's a fascinating account. My mother's Cabin on the Strathnaver was 573/2. They were in convoy with the Athlone Castle & two destroyers. At 12.50pm on the 14th July they were attacked and bombed by the Germans, without being hit. The day after, the convoy split up and they were left on their own. Mostly taking Indian troops to Colombo. The voyage took 7 weeks. 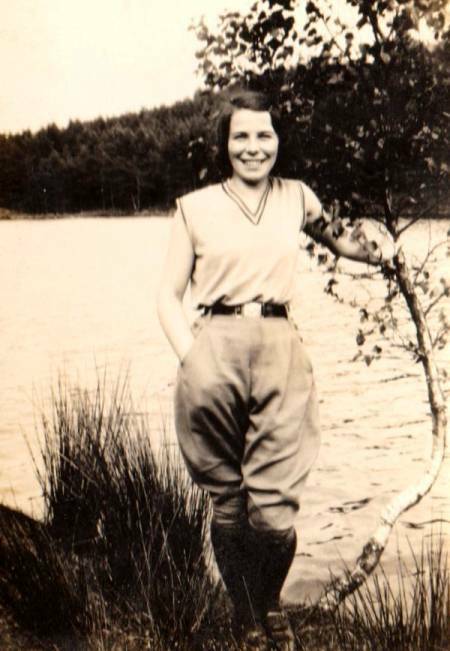 A couple of weeks earlier her husband had flown from Poole by flying boat for Darwin. Both of them made it. 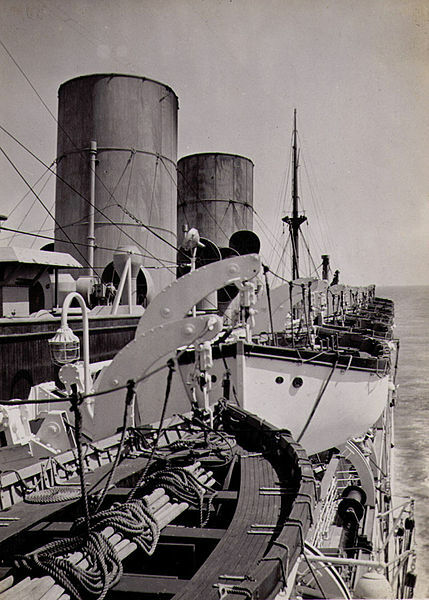 After the war, Strathnaver was used for the repatriation of troops, until November 1948, when she was reconditioned at Belfast, remaining there until December 1949. Her two dummy funnels were removed, in keeping with company policy. 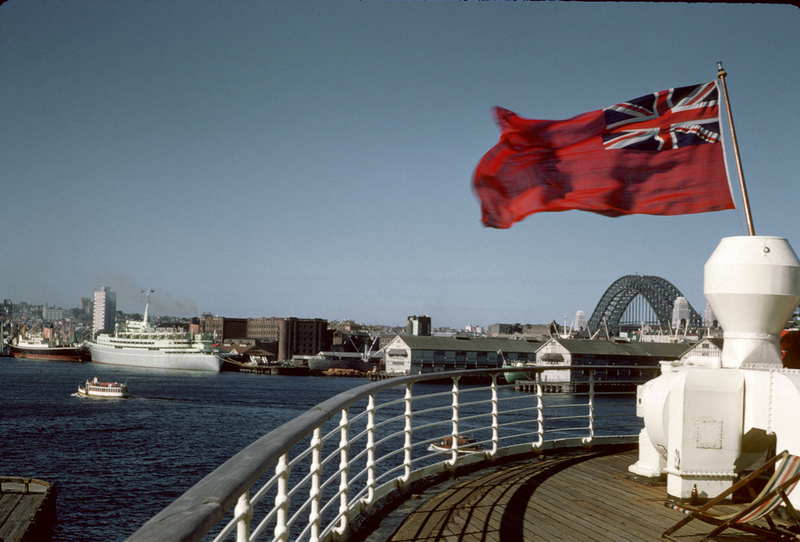 On 5th January 1950, Strathnaver resumed her normal sailing schedule on the the London - Australia service as a two-class ship, carrying 573 first and 496 tourist class passengers, until 1954, when she was converted to a one-class ship, carrying 1,252 passengers. On the 16th June 1953 Strathnaver was chartered by the Government, to take official guests to the Coronation Review at Spithead. 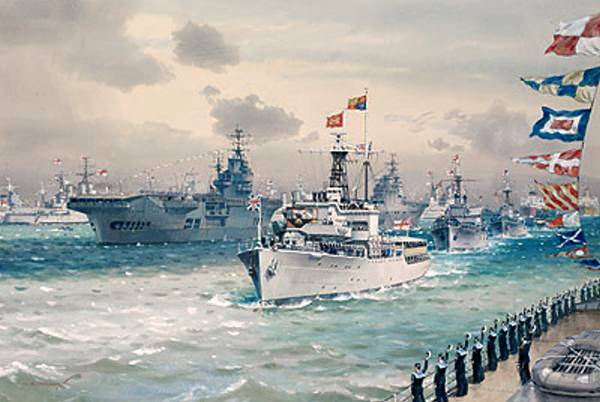 The Coronation Spithead Review of 1953, with guest liners, Pretoria Castle, Orcades and Strathnaver, following astern of the warships. Source: Maritime Originals. Strathnaver approaching HMS Vanguard, the Royal Navy's last battleship. Strathnaver and her consorts followed the track represented by the dotted line on the above chart. Before bow and stern thrusters - Tug fast 'forrard' and port head rope lowered to the waterline. Final voyage - at Sydney's Pyrmont. 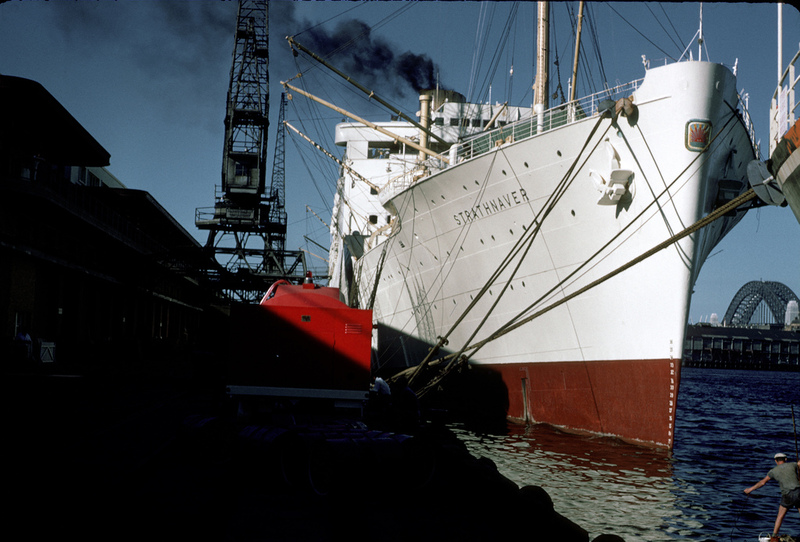 The shape of the future: Shaw Saville's ss Southern Cross berthed astern of Strathnaver at Pyrmont. 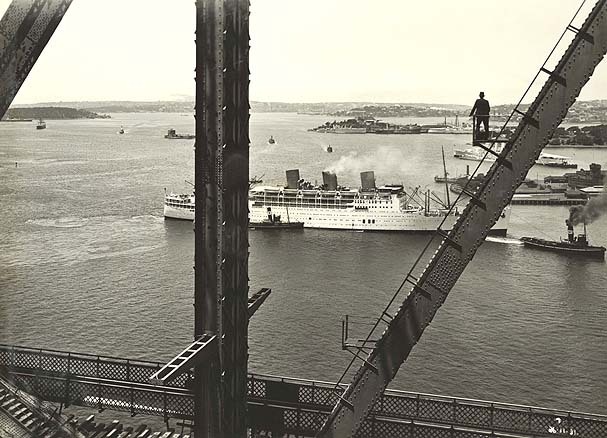 The Harbour Pilot disembarks off Sydney Heads for the last time. 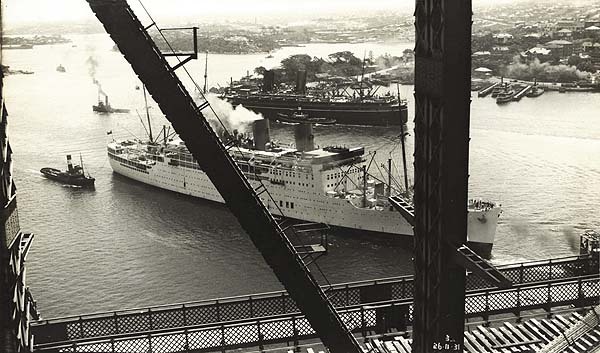 On 1st March 1962 she sailed from London on her final voyage, bound for Hong Kong, where she arrived on 3rd April 1962.